The IMAX release of Crimson Peak will be digitally re-mastered into the image and sound quality of The IMAX Experience® with proprietary IMAX DMR® (Digital Re-mastering) technology. The crystal-clear images coupled with IMAX's customized theatre geometry and powerful digital audio create a unique environment that will make audiences feel as if they are in the movie. 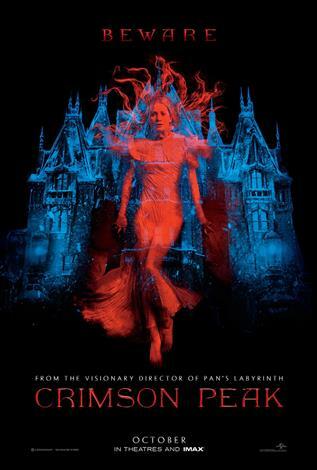 Legendary Pictures’ Crimson Peak, a co-production with Universal Pictures, is a haunting gothic horror story directed by the master of dark fairy tales, Guillermo del Toro (Pan’s Labyrinth, Hellboy series, Pacific Rim), written by del Toro & Matthew Robbins and starring Mia Wasikowska, Jessica Chastain, Tom Hiddleston, Charlie Hunnam and Jim Beaver. In the aftermath of a family tragedy, an aspiring author is torn between love for her childhood friend and the temptation of a mysterious outsider. Trying to escape the ghosts of her past, she is swept away to a house that breathes, bleeds…and remembers.